I wrote this document for my father in 2001 in order to explain some of the more important elements in his home network. This also helps him whenever he calls into the Time Warner support line. Technical support is problematic due to the number of groups responsible for support and the division of these groups involved in managing the collection of network resources (DNS servers, gateways, etc). The problem is exacerbated when these support groups don’t have clear communication paths allowing for systematic problem determination and resolution (How many times have you called into support and have to enter your customer information each time you are transferred to a different group and repeat the problem?). Understanding your network and the resources you use, can help you direct support groups and bypass the overhead that comes with talking to different people. In addition you may be able to provide yourself a backup plan for a particular resource. For example, if the DNS servers go down and you know the IP address of a particular FTP file site you use, you can enter the IP address and still perform the file transfer. The left side shows a pseudo-logical breakdown and the right side shows my father’s workstation setup. The following diagrams illustrate the relationship between the physical devices (Linksys switch and Toshiba DSL Cable modem) in relationship to the networks. 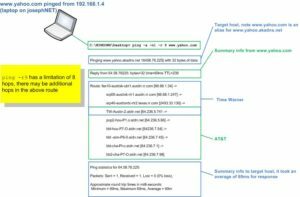 The critical points in the following diagrams are the network characteristics of eah network and in paticular, the various gateways and IP addresses that control transmission between networks. The diagrams are trivialized. 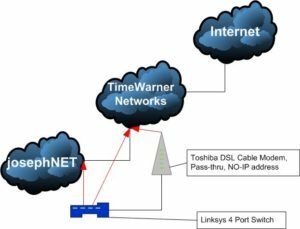 The Time-Warner network consists of a number of subnets. The table that follows reveal critical network resources (i.e. 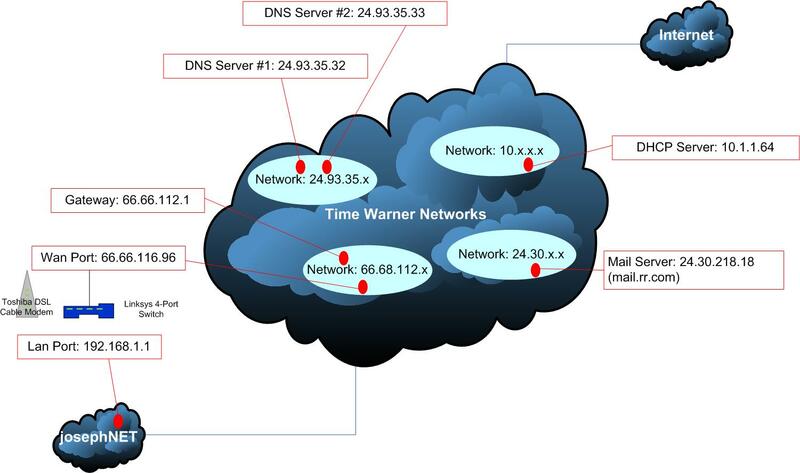 DHCP server) within the Time-Warner network. The following table shows useful network commands in understanding the various networks. ping Where is something like 24.93.35.33. Tells you if you have connectivity to a host. If the host is on the same subnet, an the MAC address of the host is cached in the arp cache. 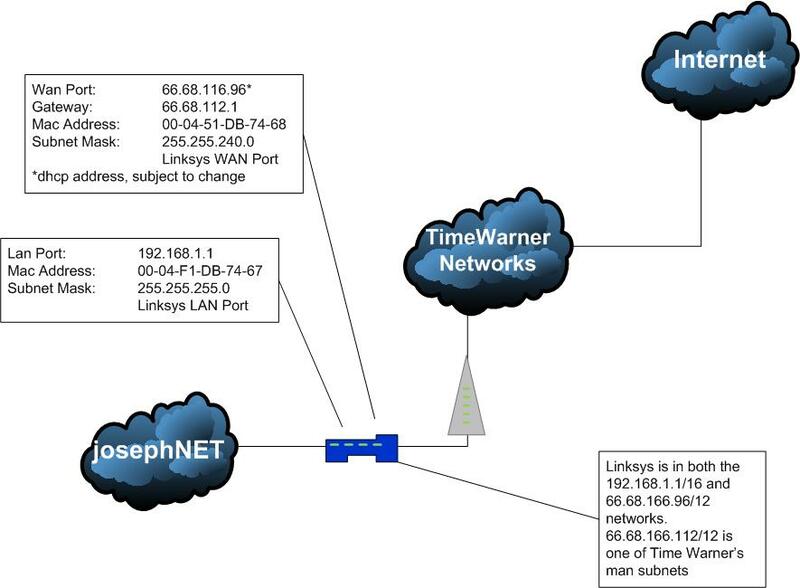 netstat -a -a = display all connections and listening ports, hostnames are included List of ports and connections. Use this to see if a particular client connection is actually made; for example, if you see port 80, this means a web server connection; port 443 would be an SSL connection...port corresponds to applications. -s = display by protocol Use this for performance issues. 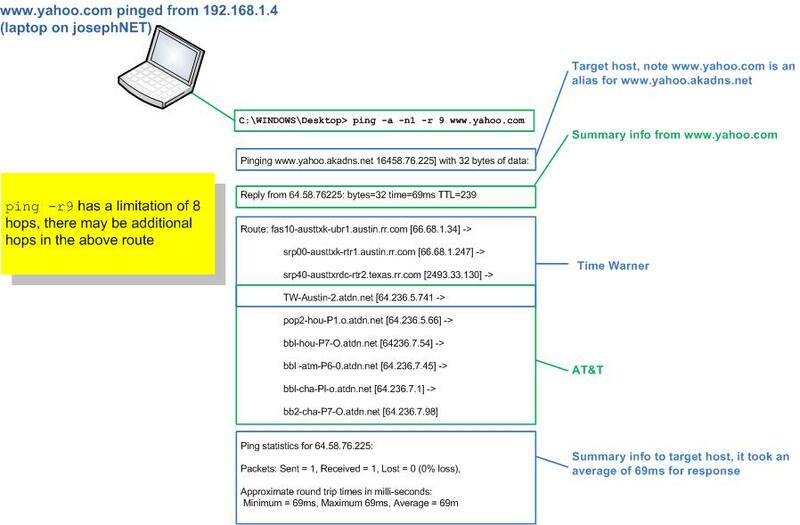 Here is an example of using ping -r to decipher the network.